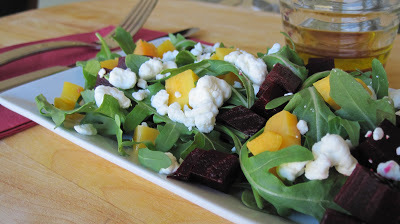 Roasted Beets and Butternut Squash Salad! For years I hated beets. 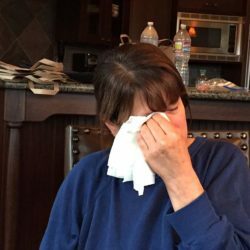 As a child I use to eat Borscht and loved it, but then one day I had a bad batch and well, I don’t even want to tell you what they tasted like, let alone smelled like. It wasn’t until this past year that I had the pleasure of tasting fresh Roasted Beets. They’re delicious and highly nutritious. It’s been found red beets help lower blood pressure the same way nitroglycerin does –by relaxing blood vessels lowering it by as much as 10.4 points within one hour of drinking 2 cups of beet juice and maintaining that over a 24 hour period. Nearly half of all adults have high blood pressure, putting them at risk for developing heart disease. If you have high blood pressure, you may be able to avoid the use of drugs by including blood pressure-lowering foods like beets in your diet. You can do that by drinking beet juice, eating canned beets or best of all roasting your own. In addition to being heart-healthy beets contain vitamin A, C, K, E and small amounts of vitamin B. They also host a list of minerals and are high in essential amino acids. Despite having the highest sugar content of any vegetable, beets are low in calories, at about 35 calories per half cup. As you can see this unpopular vegetable should find a place on everyone’s table. 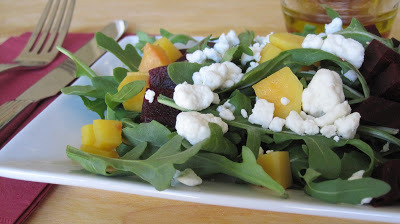 Below is a simple recipe for a Roasted Beet & Butternut Squash Salad with Arugula, Goat Cheese and a simple Champagne Vinaigrette. If you’re not a fan of beets please give them a try anyway…. from one who detested them until trying fresh roasted beets. The blend of both veggies with goat cheese makes for a very light, nutritious lunch or side salad. 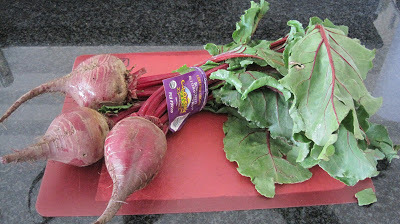 Rinse beets and trim off the leafy tops (save tops for other uses). 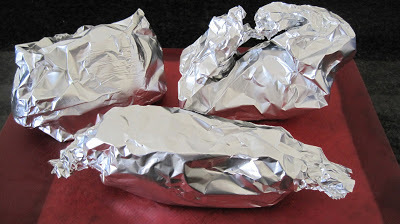 Wrap each beet loosely in aluminum foil and place in the oven. 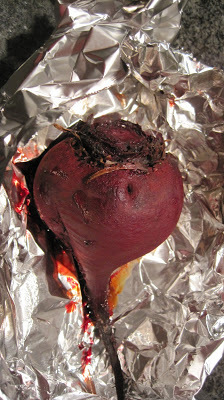 You can rub the beets prior to placing in the oven with olive oil or simply wrap dry, in foil. Roast until tender and easily pierced with the tip of a paring knife, about 1 hour. Remove from the oven and take off foil. Set aside to cool. When cool enough to handle, slice off leaf end and remove skin. 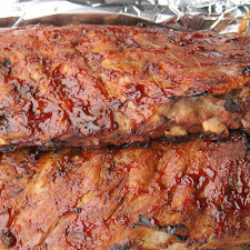 If skin doesn’t pull away easily place in oven for an additional 10 minutes. Your fingers will get stained with beet juice but it does wash off with soap and water. However, I highly recommend wearing an apron when doing this. Removing beet juice stains from clothing is difficult! 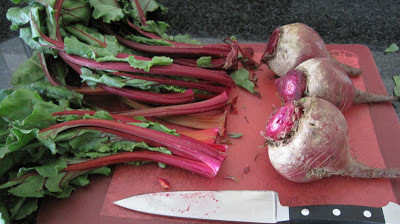 Slice beets in strips or cubes like I did and place on greens. I didn’t measure ingredients for this salad so just eyeball it. Use your favorite greens or a blend. I used Arugula topped with the cubed Roasted Beets, cubed Roasted Butternut Squash, Goat Cheese and a simple Champagne Vinaigrette. Blend and serve over salad. Note: Beet greens and stems can be used in pesto, soups, smoothies. 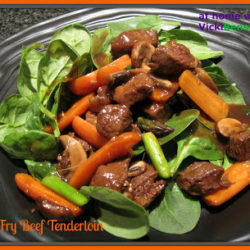 They can be sauteed, braised, steamed, boiled and pureed. The list is endless with 100s of recipes to be found online. Beets are great, and roasted ones are particularly nice. Great instructions. And a nice summary of the health benefits of beets – I knew they were “good” for you, but I didn’t realize quite how good for you they are. Interesting notes about their affect on blood pressure, too. Good post – thanks. Vicki that looks SO delicious! I always liked beets, but never had them fresh until very recently…I’m hooked! 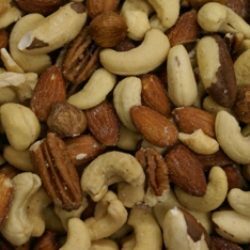 It’s nice to know they are SO good for you as well as being delish! I am so happy that I see so many beets recipes everywhere! I love beets so this post excites me! My husband roasted beets once for salad (I usually get Trader Joe’s ready made beets for simple salad). I want to make a big batch and keep it somehow… but anyway it’s totally worth the effort. I never had it with butternut squash. Sounds and looks really delicious! Vicki: This looks like such a great salad. Using roasted beets in a fabulous idea. I’ve never tried a champagne vinaigrette but it sure sounds like it must be tried. So refreshing – and orasted beets = yum! Love roasted beets! The salad looks really pretty and yummy with Champagne vinaigrette. I have two lonely beets in the fridge…and I may just roast them and eat them with your marvelous vinaigrette! Thanks, Vicki! This salad looks great. I hated beats as a kid too! This salad looks wonderful! Love the roasted beets in it. I have never roasted beets before, I normally just juice them. I know, how boring. This looks like a great recipe, will try it. Thank you for all your comments. I hope if you’ve never had beets or detest them like I did that you give Roasted Beets a try. If all else fails and you don’t like them you can always put them in the water that you boil your eggs for Easter. Then they’ll turn a beautiful color of red. That said I do hope you’ll make them and love them like I do. Asmita, according to a study though beet juice has so many health benefits. The roasted beets have a wonderful flavor but hey, I’d keep juicing them as well. Such interesting facts Vicki! I have never been a fan of beets, and it has been awhile since I have had them. After reading your post I realize need to give them a try again! I love beets but haven’t eaten it for quiet sometime 😛 That salad looks very tempting especially with that goat cheese and vinaigrette ! Love it ! Just like you, I never ever tasted anything cooked by my mum with beets. Somehow along the years, I now enjoy beets very much. I am not sure whether beet works for those with high blood pressure bc my hubby does not eat beets as advised by his doctor that it will rise the pressure level more. I am in for these superb salad and that looks so good. What a delicious looking salad and a great tutorial for roasting beets, which I’ve never done. Thanks for sharing this excellent combination of flavors, Vicki. Also, I’m having a great giveaway today with four potential prize winners, so you should enter! Oh Vicki, this is so pretty and delicious sounding! I’m always up for a new salad especially one with such lovely colors! This could definitely be a meal for me! I grew up with pickled beets and probably had them every day of my life growing up. It is only as an adult that I have enjoyed them in salads, roasted, etc. Love those beets. I’ve never had pickled beets. I’ll have to try those next. 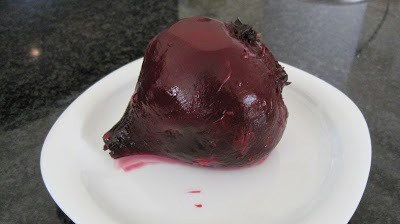 For those of you that have never tried roasted beets I hope you’ll give them a try.